What Are Dietary Restrictions of Certain Religions? Our last blog post, was about accommodating customers with food allergies, but do you know what to do if your customer has a religious restriction that limits how food is prepared and what they can eat? Hindu Dietary Restrictions… Depending on where your restaurant is located, you may have many Hindu customers or very few. Regardless of how many Hindu customers you have, understanding their dietary restrictions shows a level of respect for their religion. If they consume meat… Consumption of beef is strictly prohibited as the cow is considered sacred to them. Chicken and lamb are two acceptable meat options for non-vegetarian Hindus. Jewish Dietary Restrictions… Preparing a Kosher meal means that the meal has been made following Jewish dietary laws. No mixing meat and dairy… It is against Jewish dietary laws to mix meat and dairy and if a utensil was used to prepare or serve meat, it may not be used for dairy products. (The opposite is also prohibited) Separate pots, pans, bowls, plates and eating utensils should also be used when serving meat and dairy. Meat restrictions… Shellfish, pig, rabbits, and camels are strictly prohibited in any Kosher dish. Slaughtering process… Meat must be slaughtered in accordance to Jewish law which means the animal must be killed by slicing its throat and all blood must be drained. Muslim Dietary Restrictions… We’re seeing more and more restaurants serving Halal food in accordance with Islamic dietary laws. 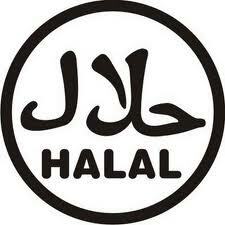 Slaughtering process… Like Kosher meat, Halal meat must be slaughtered by slicing its throat and all blood must be drained. In addition, when slaughtered they should be facing west and the Muslim call to prayer should be playing. No pig products… This includes bacon, lard, and gelatin that is made with pig products. If a food preparation item such as a bowl, knife or spoon is in contact with meat product it is no longer considered Halal and cannot be used to prepare Halal food until it is thoroughly sanitized. No alcohol… Preparing food with beer, wine, or other alcohol product is strictly prohibited. I consider myself quite fortunate. None of my kids, my husband, nor I have food allergies. However, two of my nieces have severe food allergies, so taking them to a restaurant can be a daunting trip. One niece is allergic to seafood, while the other is allergic to nuts and require an Epi-Pen if they come in contact with these foods. Their parents are diligent in analyzing the menu to ensure that their children’s food does not contain these items, nor do they come in contact with seafood or nuts in the preparation process. While parents of kids with allergies are very cautious of how and what they serve at home, taking their allergy prone children to a restaurant can be a nerve-wracking process. In essence, these parents and anyone with a food allergy are placing their trust in your kitchen’s hands. While many restaurants hesitate and even refuse to serve allergic diners, being a restaurant that can accommodate 4% of the population that suffers from food allergies, will put you ahead of your competition. Here are a few things that your establishment can do to ensure there is no cross-contamination or mistakes in these situations. Put a statement like this on your menu: “Please inform your server if a person in your party has an allergy before placing your order.” It’s unlikely that a customer with a shrimp allergy will forget to ask what kind of seafood is in the Seafood Alfredo, but if they do, this friendly note will remind them to ask first. Download a Chef Card from FAAN’s Website that servers can hand to customers with an allergy. This card tells a chef exactly what they allergic to and any types of foods that may include the allergen. An added tip is to print the card on a brightly colored paper like Lime Green or Hot Pink so that chefs can immediately recognize them regardless of how busy the kitchen becomes. Each shift managers should be trained in food allergy awareness who can inspect a dish while it is being prepared for a customer with food allergies. Compile a menu reference book with a complete breakdown of each item on your menu and what it contains. While this may be a bit time consuming, customers as well as your waitstaff will appreciate how easy it is to know what ingredients are being used to prepare each dish. Correctly label all ingredients and bins to reduce cross-contamination and other food preparation mistakes. Allow chefs and food preparation employees to take their time when preparing an allergy-free meal. If they feel rushed to have the dish prepared just as quickly as more standard dishes, they may accidentally cause cross contamination. Encourage your chef to step out of the kitchen and speak with the customer personally to make sure they understand the restrictions. Have a “Safe Menu” with several foods that do not contain any of the eight major food allergies. Consider including an appetizer, 2-3 side dishes and entrees and at least one dessert. Educate your servers that if a customer is experiencing anaphylaxis reaction they should call 911 immediately. Do not allow them to stand up as this may trigger a more fatal reaction. Take that a step further and also use separate plates and utensils. There’s an app for that! Thanks to the plethora of technological advancements, it’s never been easier to identify ingredients that are not allergy-friendly. Download an app or two to open your eyes and mind to what parents of children with food allergies have to deal with. I love the Bon’App which has an app for Apple and Google Products. Be honest with your customers. 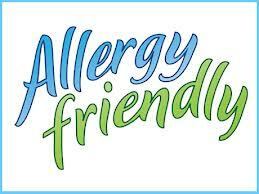 If you do not think that you can 100% accommodate their food allergy, let them know in a sincere and respectful way. Register your restaurant with AllergyEats– the premiere website for customers looking for allergy-friendly restaurants. 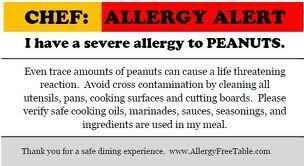 Being aware of food allergies and accommodating is not an easy task, but keep in mind that when customers find an allergy-friendly restaurant they are extremely loyal and will spread the word to their network of family and friends who suffer from a food allergy. For over 20 years, the UL certification program for food service equipment has kept consumers and restaurants safe. 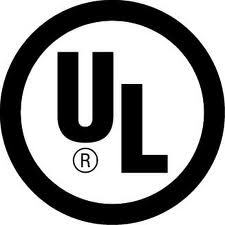 Products with the UL mark are independently tested for safety and product performance. 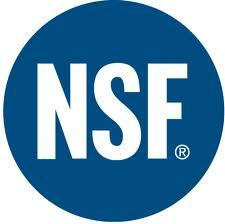 Similar to the NSF, products are tested periodically to ensure that they continue to meet the necessary safety standards. Once a products passes UL’s own set of Standards of Safety certification process can it bear the UL Mark. When buying a refrigerator for residential purposes, the process is pretty straight forward. Do you want a side-by-side refrigerator/freezer, or a freezer on the top or bottom of the refrigerator Simple! When it comes to purchasing a Commercial Refrigerator, the process is a bit more complex. Below is a Buying Guide to help you select what kind of Commercial Refrigerator your business needs. 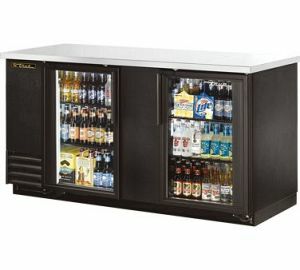 Back Bar Cooler… As a versatile piece of equipment, Back Bar Coolers can be used for storing and keeping items at ideal temperatures, and within reach. You can easily store anything from bottles, to canned goods, to open products that you use regularly like creams, juice, and garnishes for mixed drinks. Perfect for bars, coffee houses, sandwich shops, and bustling restaurants. 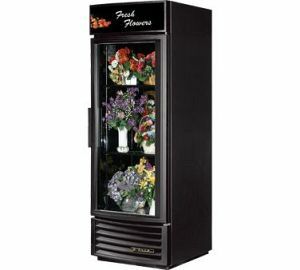 Bottle Coolers… Bottle Coolers are ideal for storing and chilling a large quantity bottled items, such as beer and wine. They allow top access rather than front access and generally feature dividers rather than wire shelves. Bottle coolers are an excellent choice for bars and clubs because of the easy access and simple setup. 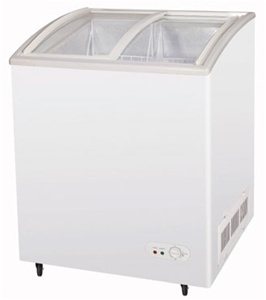 Chest Freezer… With a simple flip of a lid, you’ll be able to access your bulky frozen goods or any frozen items that need to be immediately accessed. 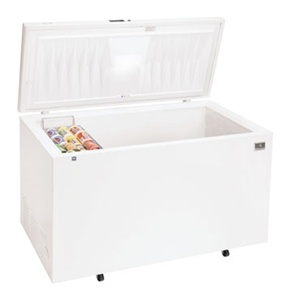 Chest Freezers are an excellent way to add freezer space to limited areas or to store bulk items that may not fit in an upright unit. 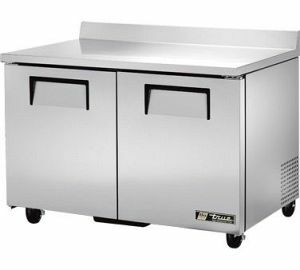 Cold Food Wells… Cold Food Wells offer the convenience of having chilled items right at your fingertips to keep production and serving lines moving quickly and smoothly. 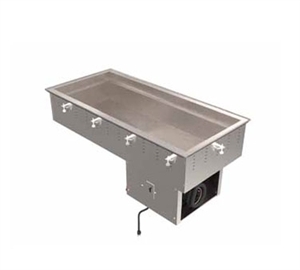 Cold Food Wells vary in size and pan capacity, making it easy for you to select the one that best suits your needs. Easily install your choice of cold food well into existing units for the ultimate in convenience. Curve Glass Display Cases… When you consider the role that merchandising and displays play in the sales of your product, a Curved Glass Display Case is ideal. They allow for organized and elegant arrangements that keep product fresh, as well as optimal visual contact to entice customers. 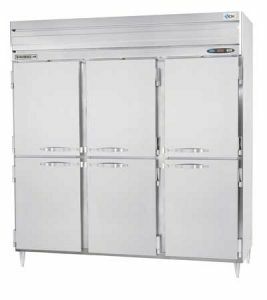 Dual Temp Combo Units… Dual Temp Refrigeration/Freezer Combo Units combines cold and frozen food storage within and single unit to save room. 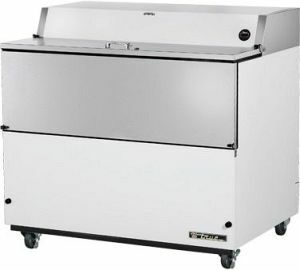 The separate sections of the Dual Temp Refrigeration/Freezer Combo Units are accessible through separate doors for temperature regulation. Floral Cases… Floral Cases are not just for flower shops. Due to their softer lighting and gentler fan, they can also be used for storing wines and pies. Freezers… Freezers are a staple in any establishment that serves food, frozen or otherwise. Depending on how much space you have and the amount of food that you need to keep frozen, select from a one, two, or three door unit. Glass and Plate Chillers… Glass and Plate Chillers keep glassware and dinnerware perfectly chilled to keep food and beverages colder, longer. When you place chilled food on a warm plate it too gets warm, same goes for beverages. Ice Cream Dipping Displays… Ice Cream Dipping Display Merchandisers adds the convenience of allowing customers to view a variety of flavors while also allowing servers to easily access the ice cream. Ice Cream Dipping Display Merchandisers store open and unopened containers for service and extra product at temperatures ideal for ice cream. 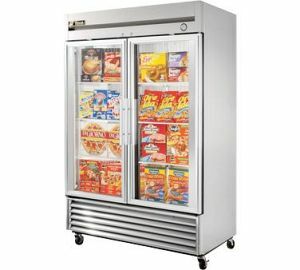 Ice Cream Merchandisers… Allow you and your customers easy access to a variety of frozen goods, such as frozen burritos, popsicles, and ice cream with an Ice Cream Merchandiser, without sacrificing easy access or great looks. 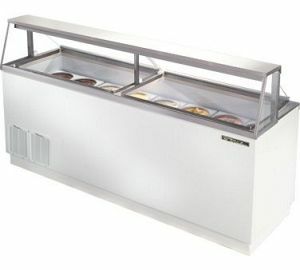 Ice Cream Merchandisers are ideal for groceries, gas stations, and diners. 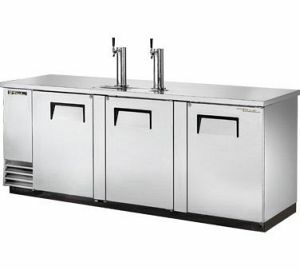 Keg Coolers…Keg coolers are essential to bars, pubs, and other establishments that serve draft beer, as they will keep the draft at an ideal temperature until the moment it is served. Customize your Keg Cooler with the number of taps, type of material, and different options. What will be stored in it? How accessible you want it to be? How much room you have to store it. Overall though, they can be used to display cakes, pies, wine, drinks, ice cream, and much more. Milk Coolers… Milk Coolers are a necessary staple in any environment, including schools, businesses, and hospital cafeterias. Milk coolers are ideal for milk storage because they prevent smells and tastes from being absorbed into the dairy product from other items. Pizza Prep Tables… Pizza Prep Tables are not just for making pizza. They are also ideal for sandwich and sub shops. 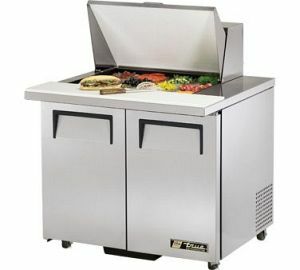 A Pizza Prep Table is a refrigerated work table with the capability to store ingredients at your fingertips. Refrigerated Bases… Finding refrigerated storage while not giving up precious work space is a dilemma that many establishments face. Refrigerated Bases offer a solution to such a problem by holding refrigerated items yet supplying a sturdy worktop for smaller appliances. 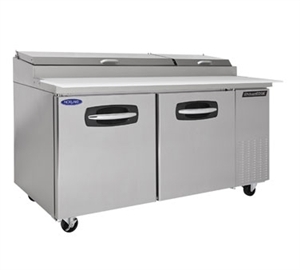 The low-profile design of Refrigerated Bases make working with them easy, and maintain the convenience of having refrigerated storage in the prep or cook area for easy and quick access. Refrigerators… Keeping ingredients and goods at proper temperatures is vital to any kitchen. 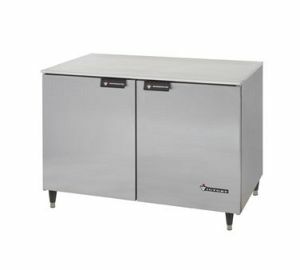 A side-by-side unit is ideal for medium to large commercial kitchens to keep the appropriate amount of items for daily use within your grasps. 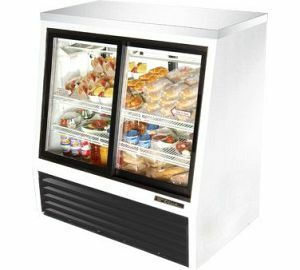 Commercial Refrigerators are available in a variety of sizes and from trusted manufacturers like True and Turbo Air. Sandwich Prep Tables… Both are great features that essentially serve the same purpose. Choosing which is best for your establishment should be based on your needs. Drawers are ideal for storing smaller containers while doors open to the complete interior and can have shelving. If you can’t choose one or the other there are models that feature both. 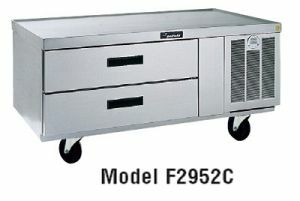 Sandwich Prep Tables are available from 24″-72″. Straight Glass Deli Cases… Straight Glass Deli Cases are great for traditional deli departments with their nearly vertical display that gives an excellent view of the products. You can easily store a wide variety of items, displaying them attractively while keeping them fresh and worthy of purchase. 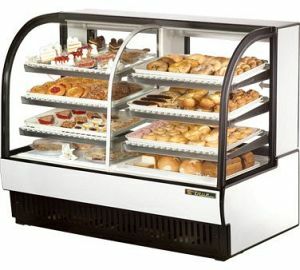 Straight Glass Deli Cases have a slightly slanted glass front that helps to reduce glare for optimal viewing. Unlike Curved Glass Deli Cases, Straight Glass Deli Cases have a solid top which allow the placement of products of measures. Sushi Display Glasses… Displays are a great way to boost the sale of a product by enticing the customers with the great look of it. Sushi Display Cases are a great way to display your product while keeping them refrigerated, be it sushi, sashimi, or anything else. Choose from self-contained or remote refrigeration in a variety of sushi display cases to meet your needs, depending on where you plan to display the fresh product. You can be sure that your product will stay at proper temperatures, keeping it fresh for longer, as well as remain visibly delectable to your customers. Undercounter Refrigerator/Freezer… One of the biggest benefits is how much space you’ll save. Undercounter units fit neatly along with cabinetry, eliminating the need for designating room for a normal refrigerator. They’re also easy to access and some units can hold as much as standing full size units. 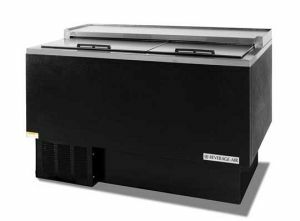 Undercounter units can be used in anywhere, from commercial kitchens to bars and even residential areas. 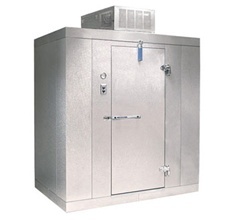 Walk-In Refrigerators/Freezers… Walk-ins are a great way to add an extremely large amount of cold storage to any establishment. They are great for indoor applications and provide adequate space for all your goods without causing the overcrowding associated with reach-ins. 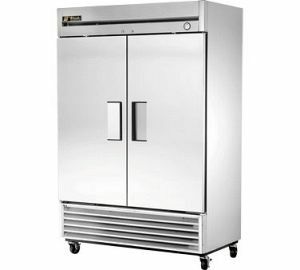 Worktop Refrigerators/Freezers… Worktop units are an excellent choice for establishments that want to maximize their use of space. They provide a refrigerator and an area to work on instead of sitting under an existing area or taking up space that could be used for dry storage. 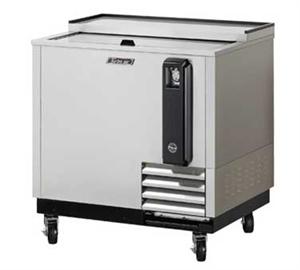 Worktop refrigeration units are great for all types of of establishments. 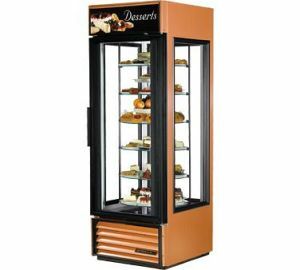 Restaurants can benefit from them because it keeps ingredients close, it makes working at a concession area or even within the home a breeze because you have instant extra space to work with as well as refrigeration.